After creating a lovely big dent in the car and it being a week or so before I could get to the garage. I thought I would 'cover up' the dented, nasty looking, paint missing, dirty great gouge in the 'A' pillar, just so that people would not stop and point at me in the street! This was going to be very much a 'quick' repair just to mask it a bit, however as it turned out I think maybe I missed my calling and should be a body shop man.. lol maybe not! Naturally being the 'A' pillar, my main concern was a decent paint match with the rest of the roof of the car. After 'biting the bullet', filling, sanding and priming the affected area, I switched to the gloss paint. 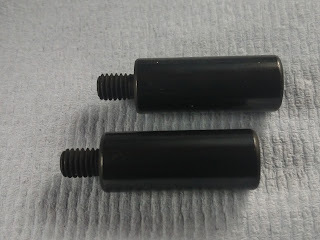 For this I used the 'Hicoat' brand of readily available spray paint, as this seems to go on smoother and be a better match for Kuro KH1 black. Spraying from the bottom up, I covered a much larger area than originally needed and did a couple of coats. Leaving this to dry hard overnight, I then applied a couple more coats on the affected area, about half way up that of the day before, making a thicker going to lighter build up of paint. Again I left overnight to harden. At this point I had good coverage, with some over spray or feathering at the end of my paint strokes. Now the tricky bit was always going to be the blending, however in the end it was very simple and I used Farecla G3 Cutting Compound Liquid. This is a very gritty paste which I applied liberally by hand all the way up the A pillar and onto the raised section of the roof. Ideally it has to be machined off with plenty of water and I used my machine polisher set at 2.5, dipping the sponge into a bucket of water regullarly so as to avoid 'burning' the paint. Suffice to say, a very wet sponge on the end of a rotary tool was messy and nasty! However the result was almost instant the overspray gone and a perfect blend. As per normal it being my first attempt I may have done things differently and did not apprieciate quite how fast it would cut away the new paint. happily I got away with it though! All that was required was some final polishing and a light wax. 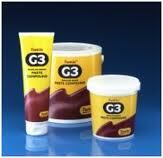 G3 compound is wicked stuff and I can see how it would be a most excellent solution to 'flat' paintwork on cars. However I really think it should be used with great caution and am not convinced it would work at all on a metallic finish. Now once more Ms Skyline is attractive again, although after the machine polishing phase, rather in desperate need of a wash!